Positive Singles launched its IOS and Android app. The app comes with an array of features which allow users the opportunity to search for other STD singles within the area, gain STD dating advice and chat with others or a live counselor. Smartphones and tablets have shifted the way people learn new information and communicate. Soon, if not already, mobile internet users will outnumber PC users and it is important for Positive Singles to be at the forefront of what the future looks like. Online dating is quickly becoming the option of choice for many singles and Positive Singles is releasing their new app to support this increased trend. After users register for the mobile app they will immediately be taken to the pattern lock configuration interface. This is a common security mode used by many smartphone users who seek to protect the contents of their device. In order to protect their privacy users will need to connect at least four dots to activate the pattern lock. While it is recommended, it is not mandatory for users to utilize this feature. Also, if the user forgets their “password” the option to reset or reestablish a new password is available. After the user has successfully logged into the mobile app they will be taken to the profile list page. This sortable page lists matches criteria according to their last login time. It displays their photo, username, age, location and other information per the user’s request and can be sorted by distance, last or newest login. If users have public profile details attached to their picture the information can be accessed by tapping the “profile” icon in the lower left corner. Users also have the option of making their photo albums private. In order to view a private photo users would need to request access from the owner. If a member’s account has expired they have the option of deleting their photos or moving them to public status. This feature displays two potential matches on the screen allowing them to decide if they are interested in meeting. 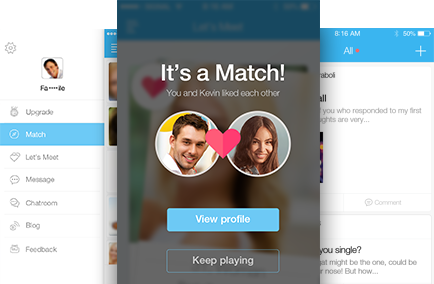 In order for users to be notified as a match both individuals need to have identified interest in each other. If interested he or she can tap the user’s profile or if not, simply skip by swiping to the next option. As long as the user has uploaded a photo they can use this feature. Gold members have unlimited access while standard member are allowed to “play” three rounds and then subjected to a 30 minute delay before playing again. The app comes complete with a detailed message interface, however only Gold members can initiate messages. At this time, images are not supported in the message feature. Another method of connecting is the chatroom. This allows users with Gold status to join a conversation or initiate a particular topic. Standard members can view chat messages but cannot participate in the conversation. This feature is a big part of the app just as it is on the full website. The blog allows users to gain information from other member’s experience as well as share their own personal STD story. The blog covers an array of topics ranging from initial diagnosis to establishing healthy relationships. Positive Singles has the largest chart room for people with STDs. The chat room is very active, nearly thousands of members online chat at one time. But this feature is only available for gold members. This feature takes users to the page which allows them to update their membership status as well as set up monthly auto-renewal payments. Payments are processed by google play IAP or iOS, however users with three or six month payment status do not have the auto renewal option. This takes users to the page which allows them to change privacy and notification settings. The can also add or remove other users from their list of blocked members. It is also where users can submit feedback or log out of the app completely.